Many visitors to the Garden Route want to visit the Big Tree and not many know that there are in fact two of them! 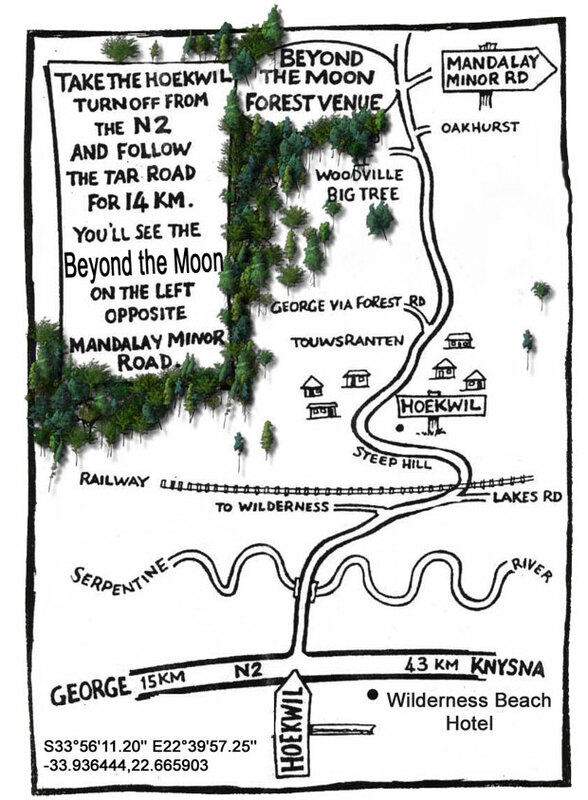 The one close to Harkerville and then the not so well-known one in the Woodville forest close to Wilderness. 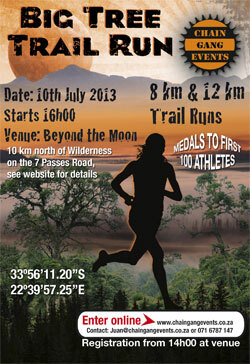 Chain Gang Events have liaised with the owners of the guest farm Beyond the Moon and SANparks to lay on two trail routes (8 km & 12 km) that both include a viewing of the Woodville Big Tree. These trails will form part of a future trail series, so be part of the inaugural group trail runners to enjoy these routes for the first time. First 100 athletes receive a medal. Trophies for Male and Female winners in both distances. Race number will be supplied (need to be attached to front of runner), i.e. bring race belt if have one. Route have some technical sections (but not severe) and runners must be prepared to get their shoes wet. The 12 km route has a significant elevation climb (310m with 25% incline) and runners who feel they are not fit to do this should rather enter the 8 km. There are escape routes on both distances and runners that get into trouble will be able to be evacuated easily. Routes will be clearly marked with arrows and coloured route markers. SANparks access fee included within entry fee.